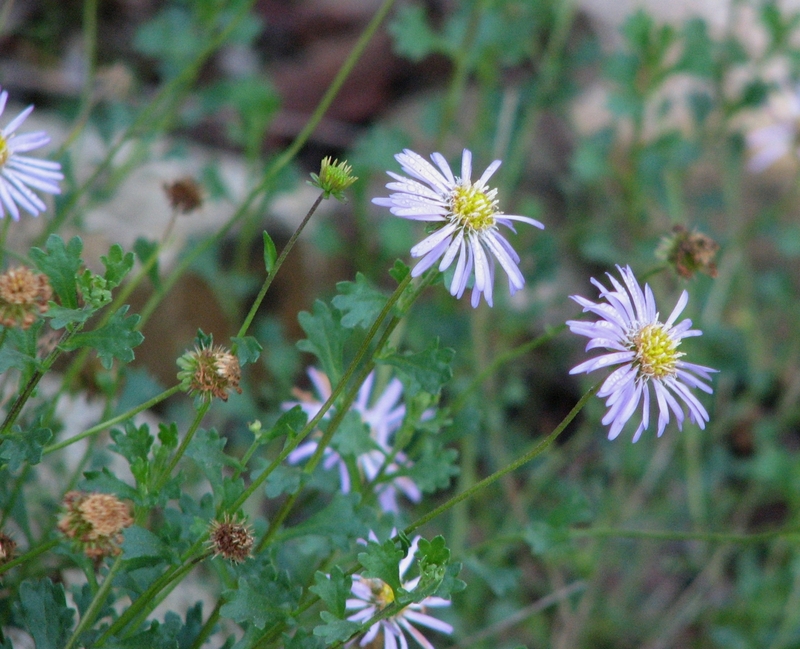 Michaelmas daisy Aster amellus, copyright Hectonichus. Aster is a Holarctic genus of composite-flowered herbs. Characters (from Hickman 1993): Annual or perennial from caudex or rhizome. Stem generally erect, 1–20 dm. Leaves basal, cauline, or both, alternate, generally entire; basally generally petioled. Inflorescence with heads generally radiate, solitary or in a cyme or panicle; involucre obconic to hemispheric; phyllaries in 2–6 series, outer generally smaller than inner, free, at least inner with pale, papery margins; receptacle more or less flat, naked. Ray florets 0–many; corolla violet to pink or white. Disk florets many; corolla and anthers generally yellow, tube generally narrower than throat; anther tips more or less triangular; style branches flat on inner face, base more or less warty, tip acute, hairy. Fruit generally rounded, more or less ribbed, more or less brown; pappus of bristles, white to brownish. [BT72] Baker, E. W., & D. M. Tuttle. 1972. New species and further notes on the Tetranychoidea mostly from the southwestern United States (Acarina: Tetranychidae and Tenuipalpidae). Smithsonian Contributions to Zoology 116: 1–37. [H09] Heltmann, H. 2009. Der Königstein (Piatra Craiului), die Perle der Burzenländer Gebirge. Mauritiana 20 (3): 515–527. [MS98] Margulis, L., & K. V. Schwartz. 1998. Five Kingdoms: An Illustrated Guide to the Phyla of Life on Earth 3rd ed. W. H. Freeman and Company: New York. [MH98] Morikawa, H., A. Higaki, M. Nohno, M. Takahashi, M. Kamada, M. Nakata, G. Toyohara, Y. Okamura, K. Matsui, S. Kitani, K. Fujita, K. Irifune & N. Goshima. 1998. More than a 600-fold variation in nitrogen dioxide assimilation among 217 plant taxa. Plant, Cell and Environment 21: 180–190. [O88] Ohba, H. 1988. 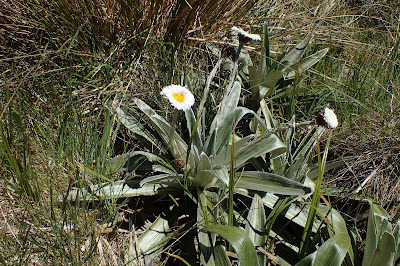 The alpine flora of the Nepal Himalayas: an introductory note. In: Ohba, H., & S. B. Malla (eds) The Himalayan Plants vol. 1. The University Museum, University of Tokyo, Bulletin 31: 19–46. [P01] Pennisi, E. 2001. Linnaeus’s last stand? Science 291: 2304–2307. [R00] Ramond, C. 1800. Suite des plantes inédites des Hautes-Pyrénées. Bulletin des Sciences, par la Societé Philomathique de Paris 2 (42): 140–141. [Y98] Yannitsaros, A. 1998. Additions to the flora of Kithira (Greece) I. Willdenowia 28: 77–94. Purple burr-daisy Calotis cuneifolia, copyright Melburnian. Calotis is a genus of composite-flowered herbs endemic to Australia (Black & Robertson 1965). Characters (from Black & Robertson 1965): Herbs with alternate leaves; fruiting heads usually globular and burr-like. Involucre mostly hemispherical, the bracts in about two rows nearly equal, with scarious margins; receptacle flat or convex, naked; ray-flowers ligulate, female, mostly in one row; disk-flowers tubular, bisexual but usually barren; anthers obtuse at base; style-branches linear in ray-flowers, lanceolate and coarsely papillate in disk-flowers, stigmatic lines only present in fertile florets; achenes compressed, narrowed towards base, sometimes winged; pappus of short awns or bristles, barbellate with reflexed or spreading hairs (barbules), and accompanied sometimes by narrow or broad scales. Twiggy daisy-bush Olearia ramulosa, copyright Melburnian. 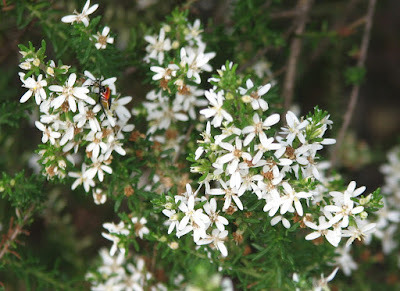 Olearia, tree daisies, is a genus of composite-flowered trees and shrubs found in Australasia (Allan 1961). Characters (from Allan 1961): Shrubs or trees with alternate or opposite leaves, these mainly tomentose below. Capitula small to large, solitary, or inflorescence variously compound; receptacle alveolate, flat or convex; phyllaries imbricate in several series, margins dry or scarious. Ray-florets, if present, ligulate to filiform, pistillate; disk-florets perfect, tubular. Anther-cells usually acute at base; style-arms of disk-florets flattened, with short obtuse or acute unreceptive tips. Achenes ribbed or striate, usually pubescent to pilose; pappus of unequal barbellate bristles, often slightly thickened at tips. [CA27] Cockayne, L., & H. H. Allan. 1927. Notes on New Zealand floristic botany, including descriptions of new species, &c. (No. 5). Transactions and Proceedings of the New Zealand Institute 57: 48–72. [D95] Dawson, M. I. 1995. Contributions to a chromosome atlas of the New Zealand flora. 33. Miscellaneous species. New Zealand Journal of Botany 33: 477–487. [EF04] Etten, E. J. B. van, & J. E. D. Fox. 2004. Vegetation classification and ordination of the central Hamersley Ranges, Western Australia. Journal of the Royal Society of Western Australia 87 (2): 63–79. [KC83] Körner, C., & P. Cochrane. 1983. Influence of plant physiognomy on leaf temperature on clear midsummer days in the Snowy Mountains, south-eastern Australia. Acta Œcologica Œcologiae Plantae 4 (2): 117–124. [N88] Nelson, E. C. 1988. Holotype of Olearia semidentata Decne. New Zealand Journal of Botany 26: 465–466. 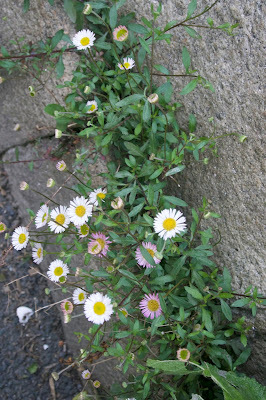 Mexican fleabane Erigeron karvinskianus, copyright Colsu. 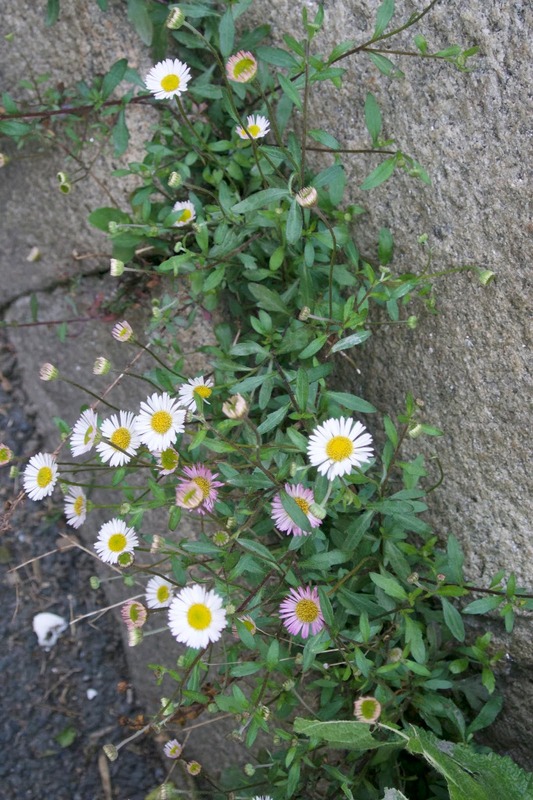 Erigeron, the fleabane daisies, is a cosmopolitan genus of herbs and subshrubs with generally radiate heads, often borne in loose clusters (Hickman 1993). Characters (from Hickman 1993): Annual to perennial (subshrub). Stems generally erect. Leaves alternate, generally entire. Inflorescence with heads generally radiate, one to many in loose, panicle-like or flat-topped clusters; involucre hemispheric; phyllaries narrowly lanceolate, in two to several equal to strongly graded series; receptacle flat to steeply conic, naked, smooth to shallowly pitted. Ray florets, if present, generally ten to many; ligules generally white, pink, or blue (rarely yellow). Disk florets many; corollas generally narrow funnel-shaped, yellow; style tips 0.1–0.8 mm, more or less triangular. Fruit 0.5–3 mm, generally more or less oblong, compressed to more or less cylindric, generally two-ribbed, generally sparsely hairy; pappus, if present, generally of 6–50 longer inner bristles and shorter outer bristles, narrow scales, or short crown. [BR65] Black, J. M., & E. L. Robertson. 1965. Flora of South Australia. Part IV. Oleaceae-Compositae. W. L. Hawes, Government Printer: Adelaide. [CP02] Chung, S.-W., & C.-I. Peng. 2002. Senecio kuanshanensis (Asteraceae), a new species from southern Taiwan. Botanical Bulletin of Academia Sinica 43: 155–159. [C61] Cuatrecasas, J. 1961. Studies on Andean Compositae V. Proceedings of the Biological Society of Washington 74: 7–28. 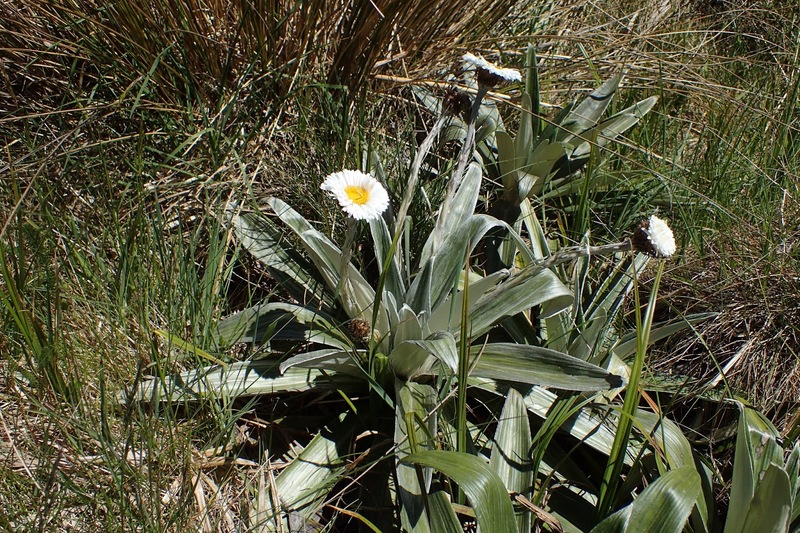 The subsection Angustatae of the genus Celmisia is a group of New Zealand mountain daisies with lamina of a narrow-lanceolate to linear order (Allan 1961). Characters (from Allan 1961): Herbs arising from hard stocks; leaves in dense tufts, lamina of narrow-lanceolate to linear order. Disk-florets yellow. Celmisia coriacea var. semicordata, copyright Krzysztof Ziarnek, Kenraiz. Contains: Celmisia subsection Angustatae, Celmisia subsection Imbricatae, Celmisia subsection Rosulatae. Celmisia, mountain daisies, is a genus of perennial herbs or subshrubs found primarily in New Zealand with a few species known from Australia (Allan 1961). Characters (from Allan 1961): Perennial herbs or subshrubs of diverse habit; leaves densely tufted or imbricate along brnaches; usually tomentose, at least on lower surface, petioled or lamina passing almost directly into persistent sheath. Capitula solitary on bracted scapes (rarely with branched scapes). Phyllaries usually numerous, imbricate in several to occasionally rather many series, narrow; receptacle pitted, sometimes strongly so, more or less convex. Ray-florets pistillate, usually in one row, often numerous; limb white, rarely flushed lilac to pale mauve or very pale yellow. Disk-florets perfect, numerous, corolla funnelform to tubular, five-toothed, yellow (rarely purple or very pale yellow). Anthers more or less sagittate, tails, if present, very short. Style-arms flattened, apically appendaged. Achenes usually more or less narrow-cylindric and ribbed, hairy to glabrous; pappus of usually numerous unequal strongly to weakly barbellate hairs. Monarch rosemallow Hibiscus radiatus, copyright Prenn. The Eumalvoideae are a clade of flowering plants corresponding to the 'Malvaceae' in the strict sense, excluding taxa previously classified in the Bombacaceae, Sterculiaceae or Tiliaceae. The name was used by Baum et al. (2004) to refer to the smallest clade including the type species of the tribes Malveae, Gossypieae and Hibisceae. [BB07] Baishya, A. K., & P. J. Bora. 2007. Cross community ethno-medico botany of Dibru-Saikhowa Biosphere Reserve, Assam. Bulletin of the Botanical Survey of India 49: 121–154. [BAN98] Baum, D. A., W. S. Anderson & R. Nyffeler. 1998. A durian by any other name: taxonomy and nomenclature of the core Malvales. Harvard Papers in Botany 3 (2): 315–330. [BS04] Baum, D. A., S. D. Smith, A. Yen, W. S. Alverson, R. Nyffeler, B. A. Whitlock & R. L. Oldham. 2004. Phylogenetic relationships of Malvatheca (Bombacoideae and Malvoideae; Malvaceae sensu lato) as inferred from plastid DNA sequences. American Journal of Botany 91: 1863–1871. [NDA05] Nickrent, D. L., J. P. Der & F. E. Anderson. 2005. Discovery of the photosynthetic relatives of the "Maltese mushroom" Cynomorium. BMC Evolutionary Biology 5: 38. [PP07] Pandey, R. P., & P. M. Padhye. 2007. Studies on phytodiversity of Arid Machia Safari Park-Kailana in Jodhpur (Rajasthan). Bulletin of the Botanical Survey of India 49: 15–78. [P03] Paul, T. K. 2003. Botanical observations on the Purulia pumped storage hydropower project area, Bagmundi Hills, Purulia district, West Bengal. Bulletin of the Botanical Survey of India 45: 121–142. [PT01] Pemberton, L. M. S., S.-L. Tsai, P. H. Lovell & P. J. Harris. 2001. Epidermal patterning in seedling roots of eudicotyledons. Annals of Botany 87: 649–654. [RM07] Ramos, M., & G. J. de Moraes. 2007. Predatory mites associated with Steneotarsonemus spinki (Acari: Tarsonemidae) on rice in Cuba. In: Morales-Malacara, J. B., V. M. Behan-Pelletier, E. Ueckermann, T. M. Pérez, E. G. Estrada-Venegas & M. Badii (eds) Acarology XI: Proceedings of the International Congress pp. 459–462. Instituto de Biología and Faculdad de Ciencias, Universidad Nacional Autónoma de México, Sociedad Latinoamericana de Acarología: México. [RA07] Rodrigues, J. C. V., D. Achor, E. W. Kitajima, N. L. Nogueira & C. C. Childers. 2007. Plant diseases and injuries associated with Brevipalpus mites. In: Morales-Malacara, J. B., V. M. Behan-Pelletier, E. Ueckermann, T. M. Pérez, E. G. Estrada-Venegas & M. Badii (eds) Acarology XI: Proceedings of the International Congress pp. 381–390. Instituto de Biología and Faculdad de Ciencias, Universidad Nacional Autónoma de México, Sociedad Latinoamericana de Acarología: México. [S02] Sharma, M. 2002. Occurrence of Hibiscus radiatus Cav. (Malvaceae) in Punjab. Journal of the Bombay Natural History Society 99 (3): 544–545. [S-CK06] Soto-Centeno, J. A., & A. Kurta. 2006. Diet of two nectarivorous bats, Erophylla sezekorni and Monophyllus redmani (Phyllostomidae), on Puerto Rico. Journal of Mammalogy 87 (1): 19–26. [VT13] Vigilante, T., J. Toohey, A. Gorring, V. Blundell, T. Saunders, S. Mangolamara, K. George, J. Oobagooma, M. Waina, K. Morgan & K. Doohan. 2013. Island country: aboriginal connections, values and knowledge of the Western Australian Kimberley islands in the context of an island biological survey. Records of the Western Australian Museum Supplement 81: 145–182.